Because Laura is not only one of my favorite spiritual bloggers (you can find her brilliant posts at MotheringSpirit), she has also written a drop-dead gorgeous book about motherhood and faith. 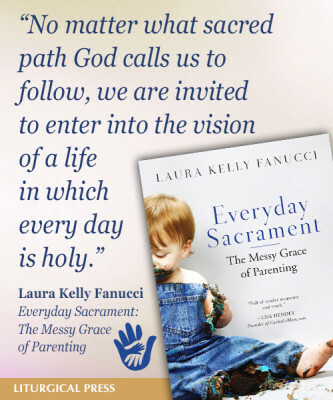 It’s called Everyday Sacrament: The Messy Grace of Parenting, and has just been published by Liturgical Press. Laura looks at the hands-on reality of parenting little ones (birthing a baby, taking a toddler cross-country, tackling the dirty laundry, bathing a newborn) through the lens of the seven sacraments of the Catholic faith. It’s written with sensitivity and honesty and beauty and, yes, grace – and it is guaranteed to make you look at your faith and your family life in a new light. Can you tell I’m a fan? It’s an honor to be the first stop on her blog tour and to kick it all off with an interview about writing and faith and the people who inspire her most. Welcome, Laura! Give us the three-sentence description of your book. Everyday Sacrament is a spiritual memoir-meets-parenting memoir. It’s a sacramental theology from the ground up – the messy ground of family life that is both hard and holy. And it’s the story of how I met God as a new mom, on the long days and in the lovely moments, too. Which sacrament was the easiest to write about through the lens of motherhood? Eucharist was the easiest sacrament for me to write about, not only because this sacrament is central to my Catholic faith but because so much of motherhood in its early years revolves around feeding children! When I have been pregnant or nursing, I often thought about what it means to give of ourselves in love to nourish a child. So I encounter Christ in powerful ways when I can see how the sacrament of Eucharist at Sunday Mass nourishes me as a mom to feed my children in turn. Writing a book is often a long process from start to finish, and of course kids grow up during that time. Are there any new “sacramental moments” you are seeing with your oldest son at the age he is now? Sam started school full-time this year, and it has been a good and growing transition for him and for us as parents to help him take steps into a wider world. I see glimpses of confirmation in the way his new school community notices and nurtures his gifts. And I see his joy in joining a group of peers and learning what it means to be a friend. All of that is holy work, even for a five year-old! I write well early in the morning, so I often try to wake up at 5 am to get in 1-2 hours of writing before the kids start to stir. Many Saturday mornings I steal away to a coffee shop to write, which gives my husband time alone with the boys as well. (Everyone wins!) I’ve learned to write in my head, while nursing the baby or making dinner, and I’ve learned to carry around a journal at all times for wherever I can fit in a few minutes to jot down an idea for a blog post or a new project. Also, I really slack off on cleaning the house. And I don’t go to the gym. You have to give something up to make time for writing! Who are the mothers who inspire you? My own mom, of course. She is one of the most generous, kind, and loving souls I have ever known. My sister inspires me, too, because she has always been so intentional about meeting her kids at each stage as they grow. I’m also inspired by friends whose children have special needs, whose journey through motherhood has been rockier than they expected but who have embraced it with deep love. And Mary the Mother of God, too. I have grown in my love for Mary in surprising ways over the past few years, and I call on her help in the “crunch” moments when the chaos gets crazy. Her presence is a welcome peace. I have so many favorite poets and novelists, but for writers whose work inspires me to bring questions of faith alive in a fresh way, my favorites would be Anne Lamott, Brian Doyle, Kathleen Norris, Ann Patchett and Wendell Berry. Even though the subject matter might seem strictly Catholic on the surface, I tried to write the book with an ecumenical heart in the hopes that Christians of many backgrounds might find echoes of their own experiences of God. I think the amazing thing about sacraments is how they lift up the holiness of ordinary objects and actions – bread and wine, water and oil, washing and eating. So many of us hunger for mindfulness in the present moment, regardless of our faith traditions. The sacraments point us back towards the power of practices that centuries of believers have found to be sacred encounters with the divine, which can inspire any of us who have seeking hearts. What is one of the greatest blessings that has come into your life through your writing? Writing has brought me greater clarity about my own callings. When I graduated from theological studies, I wrestled with how I would balance ministry with motherhood. As I started writing to make sense of my questions, I discovered that I found God in words. So writing helped me make sense of my work in theology and my work as a mother – and opened me up to how these callings might combine in creative ways. I’m still sorting through these questions, but I’m much more at peace with where God is leading. If you’re interested in reading Everyday Sacrament (and you should – seriously, it’s fabulous), you can purchase it on the Liturgical Press website, as well as on Amazon.com. It’s a super Christmas gift for any new mom or mom-to-be… and it makes a great gift for yourself as well! And be sure to visit Laura’s blog Mothering Spirit so you can follow the rest of the stops on the blog tour. What a wonderful interview. I’ll definitely put this book on my to-read list!